You can evaluate a function in the background without waiting for it to complete, using parfeval. In many cases, it can be convenient to break out of a for loop early. For example, in an optimization procedure, you can stop the loop early when the result is good enough. You can do this on one or all parallel pool workers, using parfeval or parfevalOnAll. This can be useful if you want to be able to plot intermediate results. Note that this is different from using parfor, where you have to wait for the loop to complete. Use send and poll together to send and poll for messages or data from different workers using a data queue. You can use afterEach to add a function to call when new data is received from a data queue. Use afterEach and afterAll to automatically invoke functions after each or after all elements of a parallel.Future array complete. This array can contain futures returned by parfeval, parfevalOnAll, afterEach or afterAll. Break out of a loop early and collect results as they become available. This example shows how to run multiple deep learning experiments on your local machine. This example shows how to use parfeval to perform a parameter sweep on the depth of the network architecture for a deep learning network and retrieve data during training. Uses Parallel Computing Toolbox™ to play the card game of blackjack, also known as 21. We simulate a number of players that are independently playing thousands of hands at a time, and display payoff statistics. This example runs the simulations asynchronously on a parallel pool of workers, using parfeval. In this way, we can update a display of the results as they become available. You can perform asynchronous computations on workers using parfeval and leave the user interface responsive. Use afterEach to update the user interface when intermediate computations are ready. Use afterAll to update the user interface when all the computations are ready. Run multiple deep learning experiments on your local machine. Using this example as a template, you can modify the network layers and training options to suit your specific application needs. You can use this approach with a single or multiple GPUs. If you have a single GPU, the networks train one after the other in the background. 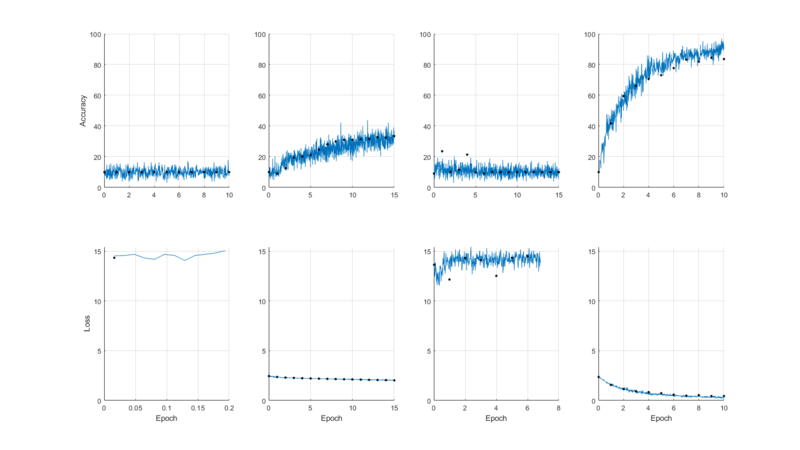 The approach in this example enables you to continue using MATLAB® while deep learning experiments are in progress.